How and when did you discover AC/DC ? A long time ago and because I was a music journalist even back then… Preparing for this book, the earliest AC/DC writing of my own I could find was a feature in Sounds, on August 28, 1976. 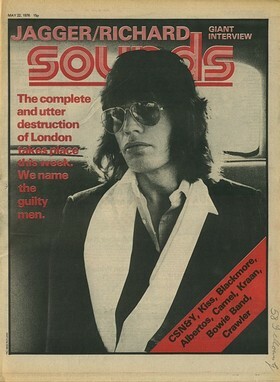 For younger highwaytoacdc readers, Sounds was a weekly London-based music paper, one of at least five at the time - imagine! I’d been on the staff for almost a year then, but I’d already handed in my notice; the following month I went freelance again and moved back to Newcastle and freelancing - for love of the woman I’m married to now. I simply can’t remember whether the night described in that feature was the first time I saw AC/DC. I have an idea I saw them at the Nashville earlier, but I may be imagining that, having read so much about their first UK gig there. Now here’s a thing: in that feature I wrote that it was the third night of their Monday night residency gigs at the Marquee (the original, in Wardour Street), but in the book I see I’d deduced it was actually the second, August 2… As you see, at this distance in time I may still be confused! Anyway, I probably went down there after hearing their first UK album, "High Voltage", and with a view to writing about them for Sounds and I remember the impression, the sensation, very well. It was a blazing hot night in one of the three hottest (UK) summers of my lifetime and there we were, at least a thousand of us in this little box of a place and onstage was the hottest hard-rock band most of us had ever seen. The flesh made liquid, it seemed, and that strange thing happened where the condensation from our evaporated sweat became so extreme that the ceiling started to rain on us. Well, I hope I got the excitement across in Sounds and then again when I revisited it for the book. AC/DC were just so direct, straight to the pulse and the bloodstream. It’s quite relevant that I was already 28/9 when they came to UK — I’d grown up with the Beatles and the Stones. The first gig I ever saw was the Stones at Stevenage Locarno, 1963 I think. I loved raw R&B and AC/DC did too and they always carried that feeling through to hard rock — to my taste, then and now, it was very important that they kept clear of heavy metal’s stodgy, crude, un-rocking and meaningless-screaming aspects. They always did. What finally decided you to launch that book project? Is there a specific triggering factor ? Mundane professional reasons — Voyageur, the publisher, asked me to do it, having been reasonably pleased with the Queen Illustrated History I did last year. So it was modestly OK paid work — important for a freelance in a recession — and a subject I knew I’d enjoy writing about. An offer I couldn’t refuse! Number 1: The “Illustrated” aspect, as emphasised by the title. 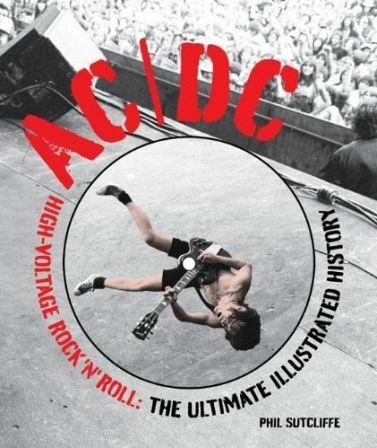 I think I’ve seen more or less every AC/DC book out there and this is the first to take this approach — which Voyageur do very well, investing heavily in picture research, in finding other related visuals (tickets, posters etc), and then in the design, the quality of printing and the large format “coffee-table” presentation. That’s why their books are relatively expensive, but also why they offer something special. 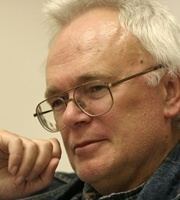 Number 2: the different points of view offered by the way Voyageur commission an assortment of writers to do the album reviews and other related thematic articles. Good work by the editor Dennis Pernu involved in all of that. You’ll gather that with all this good work going on around my narrative I’m somewhat embarrassed to have only my name on the cover. In terms of “mainly words” books the band biography by Engleheart and Durieux and the Bon biography by Clinton Walker are the biblical tomes and the team I was on in no way tried to emulate or challenge them, we were indeed producing something different. What are the messages you wanted to pass through your book about the band and their career ? Although I had to write very “tight”, as we say, because I only had about 30,000 words to play with for the narrative, I tried to be as accurate as possible — whole admitting that sometimes the “truth” is impossible to discern and alternative myths are much more fun — and then to bring out whatever I knew or could deduce about their humanity, that for all their larking about and roughness they certainly were not invulnerable to emotional upheavals and the usual trials and tribulations of the rock life. For instance, while — like every other AC/DC observer I’d say — I never got under the skin of Malcolm it was interesting to track the story of his succumbing to alcoholism and admirably strong recovery. In some sense, that resolute quality is right there in his rhythm playing, that fierce unbendability and concentration — which happens to make him the best hard-rock rhythm player ever, in my opinion. In any story, it’s the turning points that count most; some of AC/DC’s are kind of explicable, some not, but they’re all intriguing as they create the dynamics of a tale which some outsiders would see as almost featureless, but is actually full of everyman-superstar dramas. Did you meet or talk to a lot of people from AC/DC’s early days entourage ? Only the people around them in the late ‘70s when I did my AC/DC features for Sounds. What I wrote for this book was a relatively short narrative (30,000 words, about half the words in the book) drawn from all the sources I could find — books, magazines, websites — as a sort of spine of story to work with the visual material and combine into a presentation which, we hope, has both pace and depth. Some big names from the journalism world took part of your project: was it easy to convince them ? Excellent to have them all around, but I don’t know the answer to this question because all of that was organised by Dennis the editor. I don’t think he had any problem, though a) because so many writers like AC/DC (really! how could they not? they transcend genre prejudices because they’re pure rock’n’roll) b) because Voyageur pay quite well (sorry to get real on you, but all the people involved do this for a living, enjoyable as it is — we’re not hobbyists) c) because Dennis treats writers with friendly respect and fairness. During the seventies, you wrote articles about AC/DC for the "Sounds" magazine. Can you tell us more about those days ? That’s a very general question… on AC/DC I remember interviewing them at their flat in London first of all, a very informal scene as you can imagine, they’d just got up at round 4 in the afternoon, they were in good humour, lots of joking and yarning, Bon there, all of them mucking in, the manager’s sister kind of mothering them which they weren’t averse to, a bachelor pad mess everywhere - much like mine. I suppose on reflection that sort of access is very rare now, though maybe I’m wrong - if I were a young journo meeting a young band… They talked about women and booze, of course, but a nice innocent touch in the middle of them was Angus being a teetotaler and drinking only tea. I met them the following year up in Newcastle when they played a dance hall called the Mayfair. Talked to them backstage, just socialising I think, and they were friendly as ever, especially Bon, I remember his droll smile. Possibly the last time I met them — it may well have been more than three times in all, these are just snatches of memory — was at The Holiday Inn, Swiss Cottage, London, and that was where I met Angus’s wife to be, I see from my article, though I have no memory of her at all. I wonder if she was his first real girlfriend? And they’re still together I believe, which is very good news — he had a steadiness about him which maybe expressed itself both in the tea-drinking and his dedication to the guitar and to the band. Once committed, he stayed committed. Evidently! When you hear the name "AC/DC", does it remind you of one particular concert, one particular tour or anecdote ? It has to be the story behind Whole Lotta Rosie — even though Bon and Angus told me two or three different versions back in the ‘70s and they’ve told many other variants since then, it’s still a rock’n’roll cracker. 19 stone! Her 37th/29th/?? that month! And the uncertain detail about how and where it happened and who Rosie was all help to make it a proper myth — I think the book notes that when they first told me the story, the song hadn’t been completed, maybe not started even, and Bon was calling her Big Bertha? Another nice trick about the way he’d tell it is that a lot of the joke was on him, not on her — but then, I guess, they both got what they wanted, so no worries, no complaints, eh? After 40 years of rock’n’roll, what does AC/DC represent in the RNR history ? Lots of fun and a lifelong devotion to the basics of rock’n’roll. They kept the faith, stayed true to the fundamental inspirations, both black and white. The school uniform though I do find strange at this stage — I’m sure the fans would have stayed with them if Angus had dumped it any time from 30 onwards — there again it doesn’t seem to interfere with anyone’s pleasure (not mine either), it’s only a strange quirk. I guess you attended several concerts of AC/DC over the years. What is your opinion on the band’s live career evolution, from the Bon Scott’s era to the Back In Black tour, the less-successful eighties and the gigantic Black Ice tour ? Bon Scott was one of a kind. Have you met him? Do you recall some of his personality’s aspects ? Bon was a very warm person as everyone says. I always enjoyed talking to him, not least because he was so funny, and he treated me kindly — I’m very straight, but he didn’t mind that. Given what happened and what I’ve learned, while researching this book, about his dark moods and sadnesses, it’s very hard to remember whether I saw anything melancholy in him or whether that would be a retrospective adjustment of my perception of him. Probably the latter. That is, for acquaintances like me he hid whatever pained him and simply gave his best shot at having fun and sharing it with you. I never met Brian, but he seems a fine fellow by all accounts, good-hearted and a rock of stability for most of the last 30 years after the extraordinarily difficult events that brought him into the band. The Black Ice tour ended a few months ago, what is your opinion on that massive world tour ? I didn’t see any of the shows, but the internet vids looked good - a helluva comeback after all that time, I just admired it from a distance, as if a favourite football team was winning the championship (again)… If they ever go out again, I’d still like to see them play Glastonbury, Saturday night, it would be perfect.